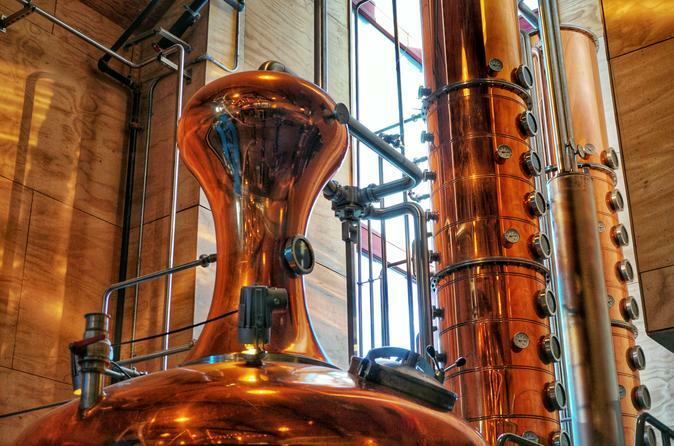 Join us for Seattle's premium distillery tour and tasting experience! On this small-group tour, limited to just 14 people, you will visit 3 of the premiere distilleries in Seattle and Woodinville that are innovating uniquely Pacific Northwest distilled spirits. At each stop on this tour, you will enjoy 4 half-ounce. pours of the best distilled spirits that the region has to offer. You'll learn what you're drinking from the distillers, have a chance to go behind the curtain, and see how these spirits and amazing flavors are made. Sometimes, we get a chance to try extremely rare single barrel products that are only available locally. We provide a complimentary gourmet snack platter with artisan cheeses, biscuits and finger food. You'll travel from point to point in a comfortable high-roof, extended length van with your guide and designated driver at the wheel. Your 4.5 hour Seattle Premium Distillery Tour will begin when your guide, and designated driver, picks you up at your downtown hotel in our comfortable high-roof, extended length van. As we make our way through downtown Seattle toward our first stop, your guide will share some of the city's distilling history and give you an overview of why spirits made with Washington grown ingredients are starting to gain real national recognition. Before long, we'll arrive at the first distillery of the tour where you will enjoy 4 different types of distilled spirits. As you sip each type of spirit, you'll learn more about what you're drinking and how it's made. After about 45 minutes to an hour, we will depart and heard toward the second distillery, about 15 to 30 minutes' drive away. At the second stop, you will enjoy another flight of 4 different types of distilled spirits. Most often, we get to try a combination of whiskeys, gins and vodkas. If you have a preference for a particular kind of spirit, you'll be able to do a deep dive and focus on just trying more from that variety. During this second stop, we provide a complimentary gourmet cheese platter and assorted finger food for the group to share. After about 45 minutes to an hour, we will depart for our third and final distillery stop. At our final stop, you'll again get to sample 4 different varieties of distilled spirits and get an in-depth tour behind the scenes. We'll spend about 45 minutes to an hour at our final stop of the day before we start heading back toward downtown Seattle. Your guide will drop you off back at your downtown Seattle hotel or any point in downtown that you prefer.